Many people who are full time RVers have a place that they like to stay for a few weeks, or even months, at a time. 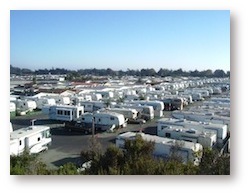 These places are called RV parks, and there are hundreds of these parks all across the United States. Staying at an RV park is not like staying at a hotel, but it is not exactly like staying at a campground either. You do not have all of the amenities that you do when you stay in hotels, but you have everything you need. And you usually have neighbors, which means that you should learn about RV park etiquette, so that you can end up with lifelong friends instead of being feuding neighbors. Follow all of the rules. You will find rules such as posted speed limits, quiet times, campfires and more, and if you want to be able to continue staying in the park, you must follow these and all other rules. Control your pets. If you are traveling with pets, make sure that they are well taken care of. This means that they need to be on leashes at all times so they are not bothering your neighbors, and dogs shouldn't be barking all day long at anything that moves. Make sure that you always clean up after your pets too. Respect your neighbors. You are always going to have neighbors when you are staying in an RV park, so it is a good idea to get to know them and make sure that you are on good terms. The last thing you want is to be having problems with the people you should be making friends with. Be careful with fires. If you have campfires, make sure that you keep them small and contained, and that you are only burning things such as wood and paper. Do not burn things that are going to smell bad, or spread a lot of ashes and smoke around the RV park. These are just a few of the things to think about when you are staying at RV parks, especially long term. Of course, most of these things, as well as most RV park etiquette, are basically just common sense, so as long as you act sensible, you should have no problems and really enjoy RV park life.